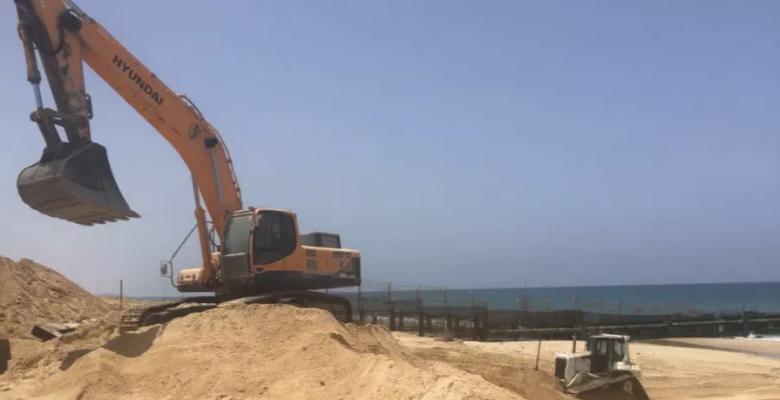 Earlier this week, Israel reported that construction of a multi-layered marine barrier between Israel and Gaza has begun. The impetus for this project was an incident from the last round of hostilities in the Strip, dubbed Operation Protective Edge, during which Hamas forces succeeded in invading Israel from the sea. Although that operation ended with all of the militants neutralized, it showed that such an attack was possible to execute. Israel’s shoreline was a weak point. The recent project began at the northern tip of the Gaza border, on Zikim beach. According to senior IMOD officials, construction is being headed by the Ministry’s Engineering and Construction Department. Work is expected to be completed by the end of the year. The unique barrier has been described by Israel’s Defense Minister Avigdor Liberman “as one-of-a-kind in the world” and “an impenetrable breakwater.” This is due to its meticulous design. The barrier consists of three layers, one below sea level, a layer of armored stone, and a third comprised of barbed wire. An additional smaller fence will be erected to surround the main sea barrier once it is completed. According to Lieberman, the barrier "will effectively block any possibility of entering Israel by sea. This will further thwart Hamas’s loss of strategic capabilities," he added. Construction on the barrier began at the same time as Gaza activists announced plans to breach the Israeli naval blockade of the territory, which has prevented any vessel traveling more than six nautical miles from the coast since 2007. Activists planned to fill the vessel with patients needing medical care, students, and job-seeking university graduates. Its intended destination was not announced. On May 29, a small boat did set sail from a Gaza port but was intercepted by Israeli Naval forces and brought to the coastal city of Ashdod. The boat was apparently trying to reach Cyprus. Reportedly, the event was quite the spectacle. Hundreds of Gazans boarded more than 30 fishing boats in support of the main vessel. However, only one boat actually crossed the six-nautical-mile permitted boundary. The group that organized the boat launch has tried to frame their activities as a continuation of the Great March of Return, the months-long campaign that saw tens of thousands of Palestinians march on the border between the Strip and Israel. Members of the so-called “Break the Siege” committee have vowed to launch another vessel in the near future. Events like the infamous Mavi Marmara incident of 2010, in which a boatload of activists from Turkey attempted to run the Israeli blockade, have shown the coastal areas surrounding the borders between Gaza and Israel can develop into huge flashpoints. From Israel’s perspective, deterrence is the best strategy.